Dimension text: The numeric value that indicates the true distance or angle between points or lines. Dimension text can include other information in addition to or instead of the number. For example, you can add a suffix, such as TYP., to indicate that a dimension is typical of several similar configurations; add manufacturing tolerances; and show dual dimensioning in alternate units. Dimension lines: In linear dimensions, indicate the true distance between points. Angular dimensions have curved dimension lines with the center of the curve at the vertex point of the objects being dimensioned. For radius and diameter dimensions, the dimension line simply points at or through the center of the object being dimensioned. 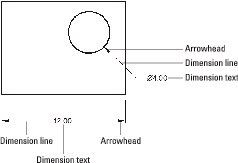 Arrowheads: Appear at the end or ends of the dimension lines and emphasize the extent of the dimensioned length. AutoCAD’s default arrowhead style is the closed, filled type, but you can choose other symbols, such as dots or tick marks, to indicate the ends of the dimension lines. Don’t get ticked off about it, but AutoCAD calls the line ending an arrowhead even when, as in the case of a tick mark, it doesn’t look like an arrow. Extension lines: Extend outward from the definition points (also known as defpoints) that you select to the dimension lines, usually by snapping to points on an object. By drafting convention, a small gap usually exists between the defpoint and the beginning of the extension line. Also by convention, extension lines usually extend just past the dimension lines. AutoCAD makes dimensions look tidier by assigning fixed gap sizes and projection lengths for the extension lines, and if you need to dimension to circles or center lines, you can assign dash-dot linetypes to either or both extension lines. Definition points (or defpoints): When you create any kind of dimension, defpoints are placed on a special layer named (what else?) Defpoints. The program creates the layer automatically the first time you issue a dimension command. These tiny points are usually invisible because the objects being dimensioned sit on top of them, but you can see them by selecting a dimension to turn on its grips. The grips appear on the definition points. Because you wouldn’t want these points to appear when you plot drawings, nothing created on the Defpoints layer ever plots. 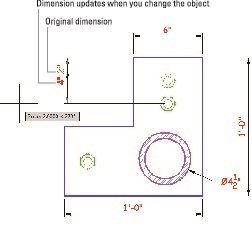 The different parts of the dimension function as a single object. When you click any part of the dimension, AutoCAD selects all its parts. The dimension is connected to the points on the object that you specified when you drew the dimension. If you change the size of the object (for example, stretch a line), the dimension updates appropriately. The lines and arrows move, and the text changes to reflect the line’s new size. Changing objects automatically updates dimensions. The associative dimensions mentioned here first appeared in AutoCAD 2002. Before that, AutoCAD had a more primitive kind of dimensioning. Dimensions were single objects, and they updated if you stretched an object if you were careful to include the dimension itself in the crossing selection for the Stretch command. Here’s where things can become confusing: AutoCAD used to call these old-style, single-object dimensions associative, but now calls them non-associative. And what used to be called non-associative dimensions before AutoCAD 2002 are now called exploded dimensions. But if you explode a dimension, you get four lines, two arrowheads, and a piece of text. Sometimes, you can’t tell the players even with a program. Old style is mentioned here only because you will probably encounter it in old drawings. Some people will try to warn you that AutoCAD dimensioning is a big, complicated, difficult subject. Don’t be alarmed, however: The basic principles are quite simple. The problem is that every industry has its own dimensioning conventions, habits, and quirks. As usual, AutoCAD tries to support them all — and, in so doing, makes things cumbersome for everyone. The good news is that you should have to adjust things to suit your specific industry or company only once, and then all dimensions will suit the specified standard. The really good news is that it usually takes only a bit of fine-tuning of the default settings to cover most of your dimensioning needs. Dimension styles are saved within the current drawing. The really, really good news is that you can save this drawing as a template file so that all new drawings created from this template will have the dimension styles predefined. Or if you’re working in an office, someone may already have set up suitable dimension styles. Or you can use DesignCenter to copy styles from one drawing to another. You add dimensions to a drawing after you’ve drawn at least some of the geometry; otherwise, you won’t have much to dimension! (Well, duh.) Your dimensioning and overall drafting efficiency improve if you add dimensions in batches: First draw all geometry and then place dimensions. Don’t draw a line, place a dimension, draw another line, place another dimension… .